The Helfrichi's Firefish is also known as the Helfrich's Dartfish, or Helfrich's Firefish. The head is distinctly yellow with a purple forehead, and the body is varying shades of purple and white. It requires a 20 gallon or larger aquarium with plenty of loose coral rubble as part of the aquascape, and a tight-fitting lid to prevent it from jumping out of the tank. It will rarely become aggressive towards other fish, but is territorial, and will fight with its own kind unless they are a bonded pair. 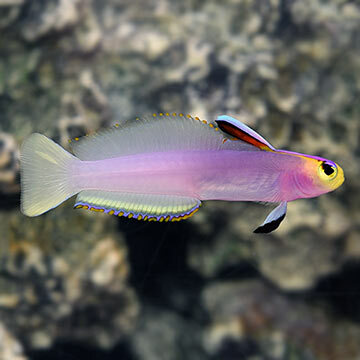 The Helfrichi's Firefish will feed mostly on prey suspended in the water column, but will pick food off the substrate. Its diet should vary between chopped or shaved seafood, vitamin-enriched brine shrimp, and mysis shrimp. Approximate Purchase Size: Small: 3/4" to 1-1/4"; Medium: 1-1/4" to 2"; Large: 2" to 2-1/2"
Excellent, easy to keep fish that is gorgeous. Do not mix with other firefish as they are intolerant of each other. Eats pellets, cyclopeeze, mysis, and flake food. Highly recommended for reef tanks. My Helfrichi is a wonderful addition to my reef tank. "She" darts about adding a splash of pastel colors. She spends her evening in a communal burrow under the live rock with my purple firefish and standard firefish. My purple had a nip out of her fin after the first day but since then, the three have been inseparable. Ordered a pair from divers den and they are great. They hide in the rocks at night and come out during the day. They are very colorful and fun fish. Love the divers den fish. They are eating brine shrimp. Beautiful fish, it hid in a cave I hadn't even seen before for a few weeks, only coming out at feeding times, but since has been out in the water column more since. Eating cyclopeeze, mysis and brine. Its more beautiful than I expected. Immediately ate mysis the day of acclimation. Easily the nicest fish in the tank. I couldn’t have asked for an easier buying process besides going to the lfs myself. This is the first fish I ever bought from Liveaquaria.com and I’m not disappointed. I am very happy! I will definitely recommend this site to anyone who will listen. And I’ll consider Liveaquaria.com first the next time I’m in the market for fish. Very nice addition to my 30 gallon cube. Has not spent any time hiding in the live rock. Hangs out right in the middle of the water column looking for swimming copapods. Eating enriched frozen brine from the first day. Has a Palau Biota captive bred Coral Beauty, yellow Clown Goby, Palau bred Blue Mandarin and a little Filefish as company.